"You're not in for one hand clapping. Rather, it's both hands clapping for joy." "Extremely well written and joyously entertaining." THEY'RE NOT WRITTEN IN STONE . . . The Ten Commandments tell us how to behave, but they don't say much about the inner awareness from which outer behavior springs. Do the right thing, sure — but better yet, find your inner light and doing the right thing becomes as natural as breathing. Here are ten powerful nudges toward that light. 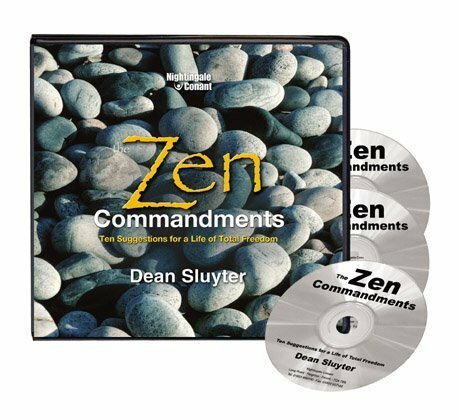 Drawing on sources from Zen stories and the Bible to jazz and rock 'n' roll, from American movies to Tibetan meditative techniques, Dean Sluyter steers clear of dogma and emphasizes what works — a sort of spiritual street smarts. He shows that the state of boundless freedom and happiness isn't something distant or exotic, but is right here, while you're stuck in traffic or taking out the trash. And revisiting the Ten Commandments, he finds that they offer some surprising enlightenment wisdom of their own. ► Read Chapter 1: "Rest in Openness." ► Buy now in paperback or Kindle. This audio version is a lively, far-ranging discussion of the book's ideas, presented in twelve half-hour sessions. Dean explores insights, tells stories, makes connections to everything from Hercules to Citizen Kane, and leads you step by step through an array of exercises and experiences. As in Dean's workshops, the style is practical, down-to-earth, and fun. ► Buy now as MP3 download or as 6-disc CD set. "If I were to run out of my burning house, after my wallet and car keys I'd grab this book. When I start to feel far from my spirituality, far from hope, far from answers, this is the book I pull off the shelf." "With sparkling clarity and wit, Sluyter's ten suggestions lay out the practical essentials of the path. My suggestion is: listen to this guy." "Dean Sluyter clearly presents simple but profound ways to live one's life consciously and skillfully. He teaches that the source of universal truth not only rests in the heart of every one of us, but is the essence of what ultimately brings us true happiness and freedom. This is a wonderful book with rich wisdom and deep insight." "No matter what your religion (or lack of it), this book shows how to live the kind of life people ache for. It turns out to be pretty simple."